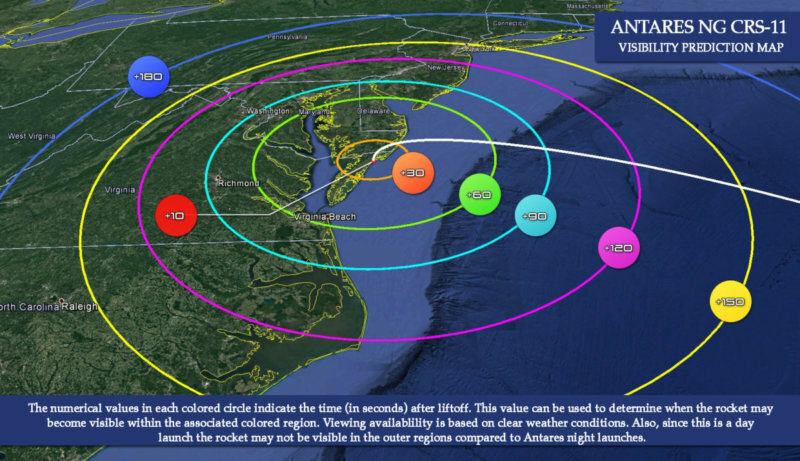 On April 17, view a daytime launch of Northrop Grumman’s Antares rocket from the Mid-Atlantic Regional Spaceport at NASA’s Wallops Flight Facility on Virginia’s Eastern Shore. Wallops and Virginia’s Mid-Atlantic Regional Spaceport are set to support the launch of the Antares rocket, carrying the company’s Cygnus cargo spacecraft to the International Space Station at 4:46 p.m. EDT, April 17. The NASA Visitor Center at Wallops opens at noon on launch day for public viewing. Additional locations for catching the launch are Robert Reed Park on Chincoteague Island and Beach Road spanning the area between Chincoteague and Assateague Islands. The beach at the Assateague Island National Seashore/Chincoteague National Wildlife Refuge will not be open during the launch. Visitors are reminded that alcohol, pets and firearms are not allowed on the NASA Visitor Center grounds. Also, because of limited parking, oversize vehicles such as campers and recreational vehicles will not be able to park on the Visitor Center grounds. If you can’t make it to the Wallops area to view the launch, you can still partake in the experience through the Wallops Mission Status Center. There you will find information about the mission and links to live countdown audio as well as live video of the launch. Live coverage of the mission is scheduled to begin at 11:45 a.m. April 17 on the Wallops video and audio Ustream sites. By clicking the tracking link on the Status Center, you can find when you may be able to see the rocket in flight and use your device to find the viewing direction to see the rocket streak across the early morning sky. Cover image courtesy of NASA’s Wallops Flight Facility. This post was submitted to WallopsIsland.org for publication and sharing. If you would like to publish your own stories or have news you think our readers would like to share use the contact page to reach out.